Zach sees Rocksteady and Bebop arrive through a portal, but because of a Turtle Com malfunction, cannot notify the Turtles. He follows the two mutants, who steal an Anxietron Ray for Krang and Shredder. This device has the power to make people frightened of anything. While testing out the ray, Bebop and Rocksteady start thinking that they could rule the world with this ray gun. They zap Krang and Shredder with the ray, turning them into cowering fools. Zach keeps trying to call the Turtles and finally reaches them. He tells them that Bebop and Rocksteady are heading to City Hall and are planning to take the city over. The Turtles rush to City Hall to stop Bebop and Rocksteady, but they end up getting zapped by the ray also. Very scared, the Turtles escape from City Hall and return to the lair, Splinter tries to help them with his Ninjitsu mind control, but is unable to. With the Turtles out of commission, Splinter decides that it is up to him and Zach to stop Bebop and Rocksteady and recover the ray. Meanwhile, while April is shooting a story on a new Gorgonzola movie, Bebop and Rocksteady arrive and scare everyone away. When they start playing with the controls for the Gorgonzola monster April threatens to call the Turtles. They find this amusing and throw her inside the robot. Splinter and Zach find Bebop and Rocksteady and Splinter tries to steal the ray from them. He fails and gets captured. Zach realizes that it is up to him now to get the Anxietron Ray back. 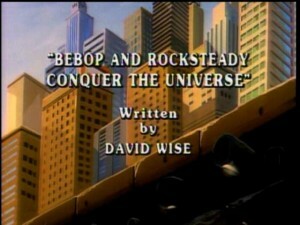 He manages to steal it from Bebop and Rocksteady and turn the Turtles back to themselves. Happy to be back to normal, the Turtles resuce April and Splinter. Back in Dimension X, Krang and Shredder manage to find an antidote for the effects of the Anxietron Ray. Furious at Bebop and Rocksteady, Shredder makes a trip to Earth and retrieves them before the Turtles capture them.